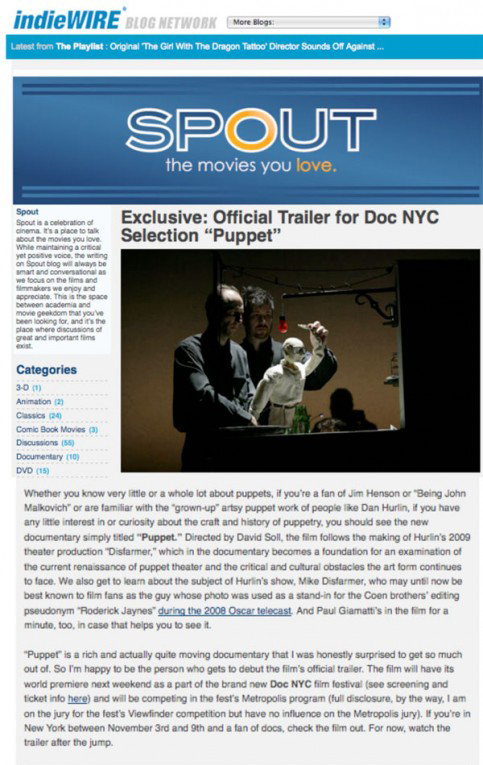 Whether you know very little or a whole lot about puppets, if you’re a fan of Jim Henson or “Being John Malkovich” or are familiar with the “grown-up” artsy puppet work of people like Dan Hurlin, if you have any little interest in or curiosity about the craft and history of puppetry, you should see the new documentary simply titled “Puppet.” Directed by David Soll, the film follows the making of Hurlin’s 2009 theater production “Disfarmer,” which in the documentary becomes a foundation for an examination of the current renaissance of puppet theater and the critical and cultural obstacles the art form continues to face. We also get to learn about the subject of Hurlin’s show, Mike Disfarmer, who may until now be best known to film fans as the guy whose photo was used as a stand-in for the Coen brothers’ editing pseudonym “Roderick Jaynes” during the 2008 Oscar telecast. And Paul Giamatti’s in the film for a minute, too, in case that helps you to see it. “Puppet” is a rich and actually quite moving documentary that I was honestly surprised to get so much out of. So I’m happy to be the person who gets to debut the film’s official trailer. The film will have its world premiere next weekend as a part of the brand new Doc NYC film festival (see screening and ticket info here) and will be competing in the fest’s Metropolis program (full disclosure, by the way, I am on the jury for the fest’s Viewfinder competition but have no influence on the Metropolis jury). If you’re in New York between November 3rd and 9th and a fan of docs, check the film out. For now, watch the trailer after the jump.